Designed by Dave Chalker and Kory Heath. Published by Critical-Hits Studios. Released in 2007, Second Edition 2013. For 3-9 Players ages 13+. Plays in 5-30 minutes. Available through DriveThruCards. Deductive, strategic, or hidden role party games usually go one way or another: Too swingy, random, and frustrating, or too specific, too exacting, and too bound up in hidden roles. 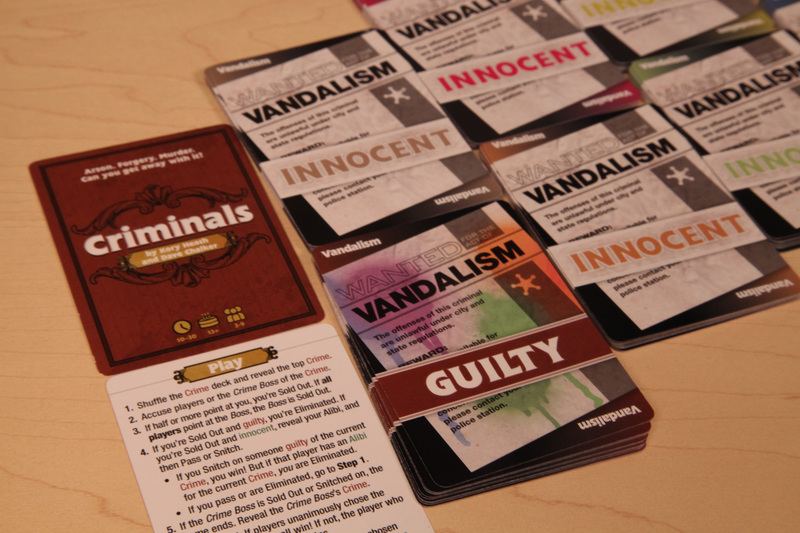 Somewhere between those two kinds of games are games like Criminals, which while it has its own problems, should find a fit for any middling to large game group looking for something that isn't the umpteenth game of Werewolf or The Resistance. 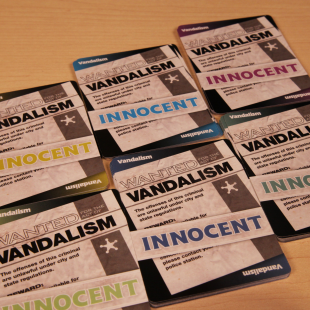 First published in 2007, the game recently got a re-release through the DriveThruCards print on demand service. It's an enjoyable game without complexity - easy to teach and learn - that scales very well from a handful to a large number of players. However, that same lack of complexity can serve to hamstring it if you want to play for more than a few games in a row. 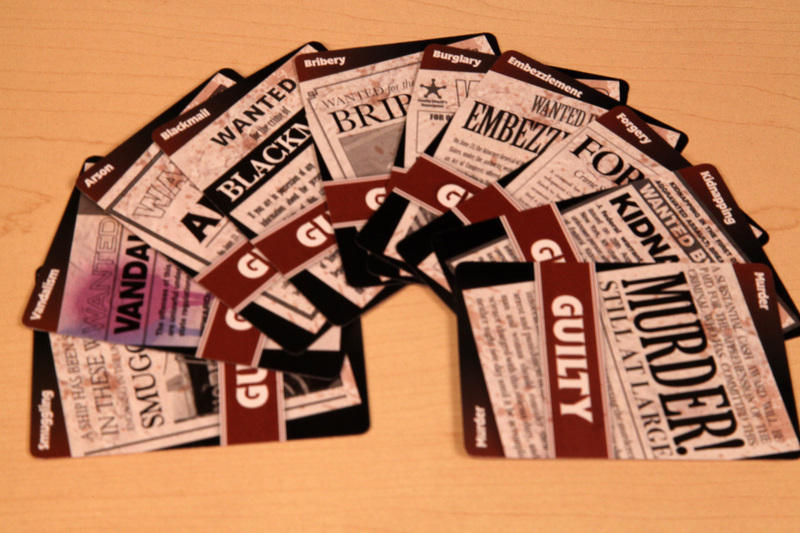 Each round, every player at the table is dealt a crime - and one crime goes to the non-player that is the crime boss. 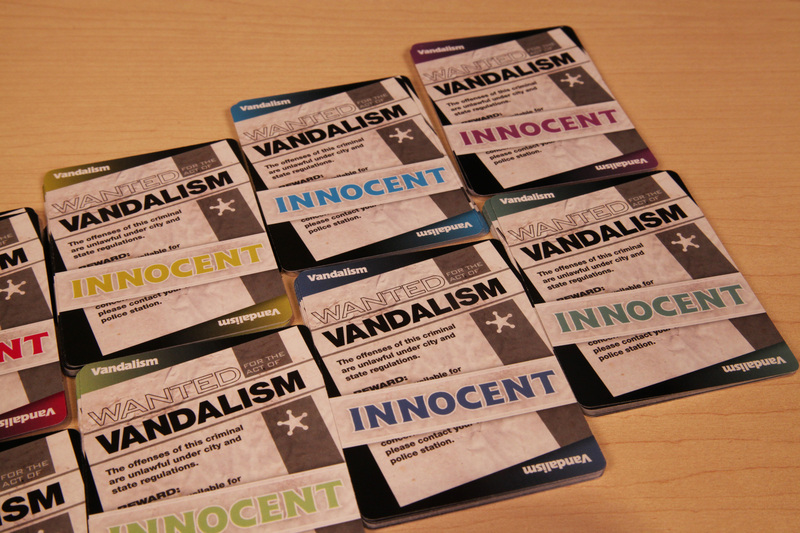 Then, a random crime comes up under investigation, and the players start accusing each other or the crime boss. If everyone thinks you did it and you did, you're out of the game. 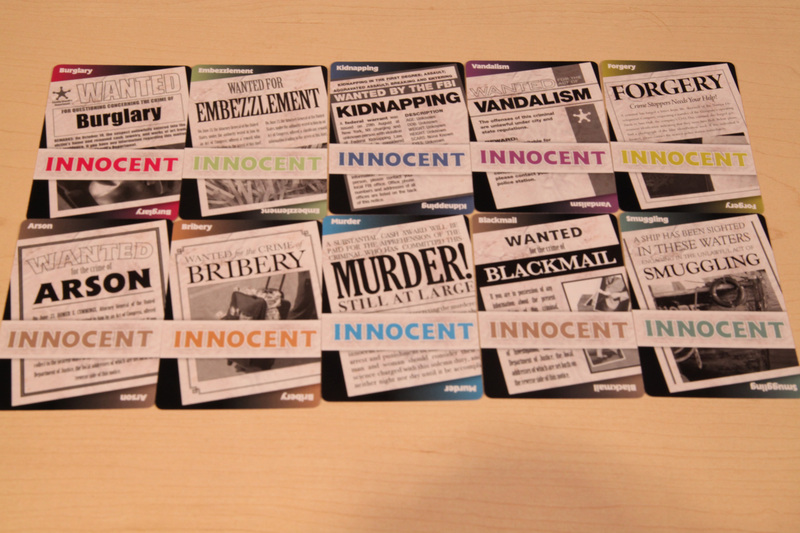 If you didn't you produce the alibi card for your crime. The game continues until there's either one person standing or everyone manages to accuse the crime boss correctly, in which case everyone wins. 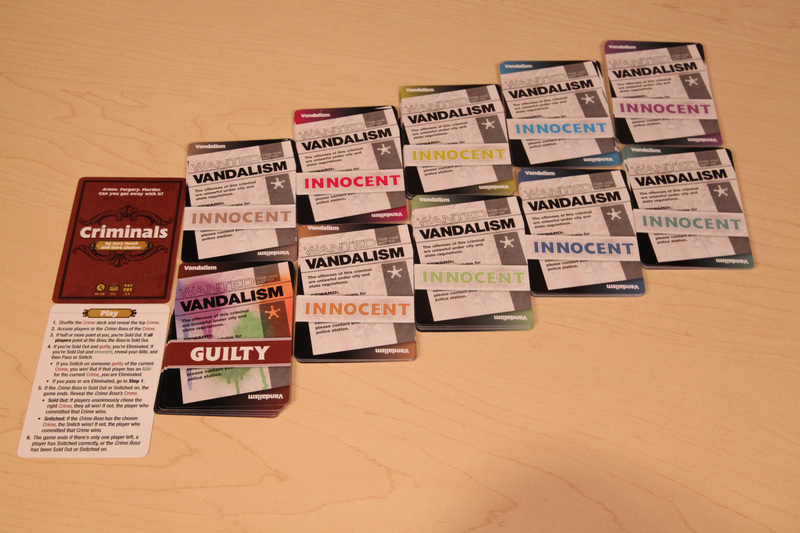 From there, it devolves into chaos, as multiple players leverage agendas to get others to accuse the wrong people for the wrong crimes, cover their own tracks, and generally misdirect the other plays into a victory. There aren't very many ways to get extra information out of the game, though, and early rounds of larger games are kind of a crapshoot - there are definitely going to be people eliminated on pure chance early on, and that can kind of sting. This is very much like the sacrificial atmosphere of the first few rounds of a game of Werewolf or Mafia, and that simultaneously contributes to a party game atmosphere and means that sometimes you sit, not playing, for 20 minutes. Thankfully, the game plays quick enough that only in the largest games will you sit out for that long, and, hey, this is a party game. You need time to get a new drink. 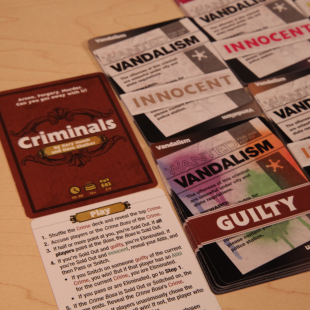 The great thing about Criminals is that it's very deductive based on a large set of known information, which feels really good and new for players that already love similar games. On the other, hand, there's a certain random knife-fight feel to the first few rounds that the game does little to mitigate. Indeed, the game's later rounds - as more information becomes known -are a lot of fun and quite social. Similarly, any smaller three or four player games are quite good as any information opens up lots of angles of deduction. All of this complexity also comes from a relatively simple set of rules, and that serves the game well. On the other hand, that simplicity isn't too fantastically deep, and you won't want to play it more than a few times in an evening. Bottom Line: While it may not be to the taste of some, Criminals is still an above-average game at a very good price. 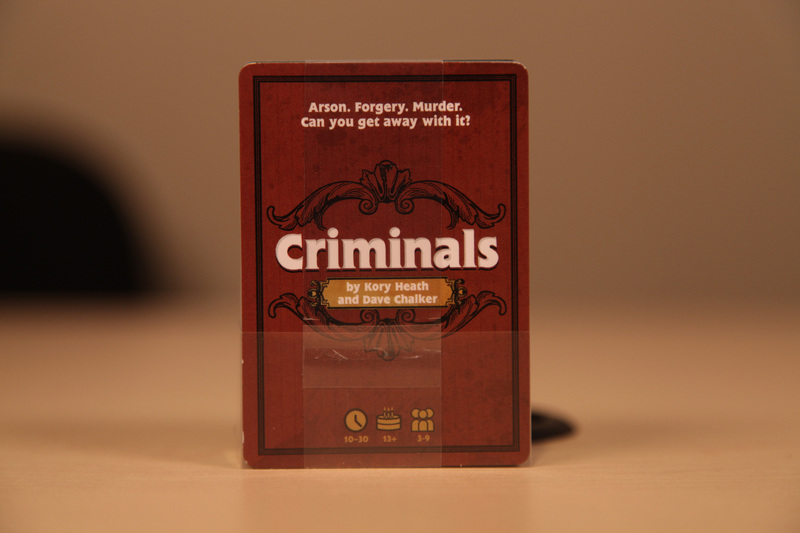 Recommendation: If you've gotten hours of fun out of party games like Cards Against Humanity or Werewolf, then Criminals is exactly the thing you should add to your collection.